Last week, live on KVOA, I talked more about packing a great lunch. Check out the segment here! 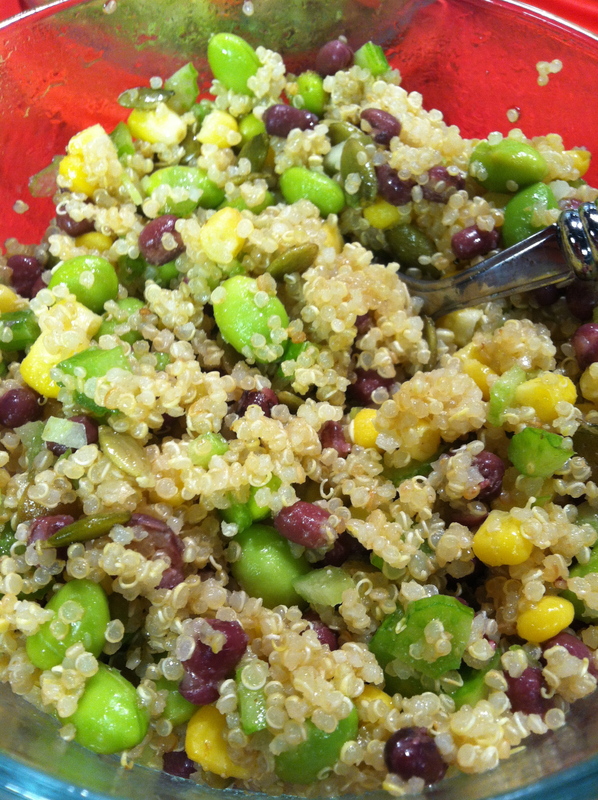 I made a great mix-and-match quinoa salad out of the ingredients that I used for the show. It turned out to be quite delicious. So good that even Dan, who normally does not like quinoa at all, said “yeah, it’s actually pretty good”. Whooohooo! I must save this recipe!! He said, “now, don’t get tooooo excited”, but this is awesome! Perhaps I have broken through some sort of quinoa cooking secret and found the answer to delicious quinoa every time. We will see. Hopefully your family likes it as much or more than mine. Cook the quinoa with water, garlic, onion and cumin. While the quinoa is cooking, chop the celery and assemble the rest of the ingredients (corn, beans, edamame, olive oil and lime juice). Add 2/3 cup of the cooked quinoa. You will have extra quinoa, just refrigerate or freeze it. Mix it all together and season with extra cumin, garlic, and onion and add avocado and pumpkin seeds if you want. Use the salad on top of greens, as a warm pilaf with a piece of grilled fish or chicken or as a side dish. I had it on greens for lunch this weekend and we had it it with quesadillas and sliced jicama for dinner. So what the made the difference for Dan? I used pre-washed quinoa in a bag instead of bulk quinoa. The last time I bought quinoa I bought it in bulk. I had forgotten that quinoa has bitter saponins on it and so it needs to be thoroughly washed. I didn’t wash it and Dan complained that the quinoa was bitter. This time, I got Bob’s Red Mill Quinoa that is pre-washed and is also specifically marked gluten-free from a gluten-free facility, so there’s no risk of gluten-contamination and that’s better for me. I cooked the quinoa with the spices, which made it really flavorful and saved me some chopping time! The salad had lots of color and texture making it a really lovely salad that was pleasing to eat. Most importantly, we had dinner outside on our patio with the kiddos. It’s hard not to enjoy your food when you eat it like that. We had this salad last night and loved it!